Recently, I replaced my 24″ monitor that has a VGA and DVI inputs with another monitor ViewSonic VX2453 that has one VGA input and 2 HDMI inputs. All is well when I connect to the VGA input from my desktop PC. But I need to share this monitor with both my PC and my laptop, which has only one HDMI output. 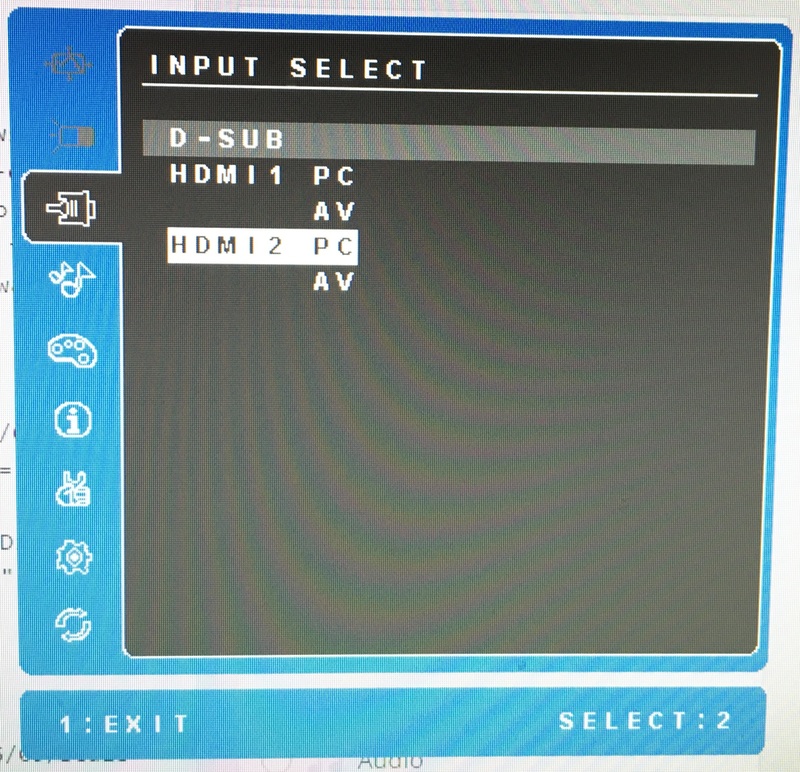 So I just need to connect the HDMI output to the HDMI input of the monitor. Simple right? Not so fast. The display turned out to be heavily cropped by the monitor, in other words only ~70% of display was shown; the rest could not be seen. I suspected there may be three possible causes: 1) my graphic display driver and 2) HDMI cable 3) the monitor settings. 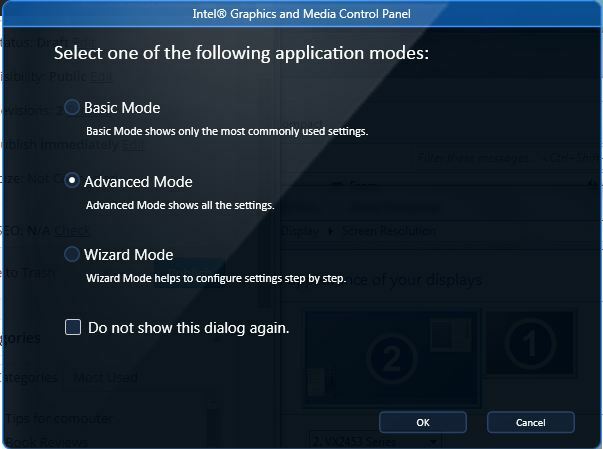 The first thing I did was to update the Intel HD 3000 graphic driver, which was dated 2011. I downloaded the Intel Driver Update Utility 2.2 . The utility failed to update the driver after 3 attempts. Then I tried to download the driver directly from the vendor’s (Acer) update site, which hosted the same old driver I had. 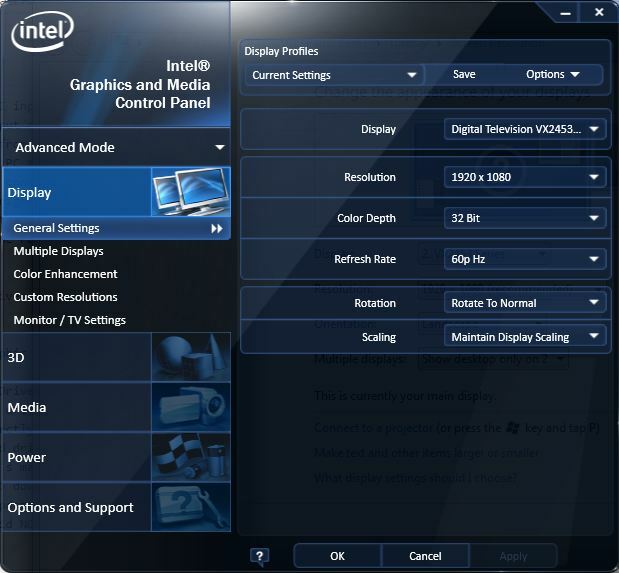 Then I Googled and found the exact driver from Intel’s manual download (go to download center and search on “hd 3000”). The worked fine to update to the latest graphic driver: dated 5/16/15. Great! But it did NOT help my monitor cropping problem. Next I tried to rule out the HDMI cable by swapping the cable with another. It didn’t help either. So this should fix it right? Yes and no. The display was not cropped but it looked like “crap” – lots of rough edges. This was not going to work for me. 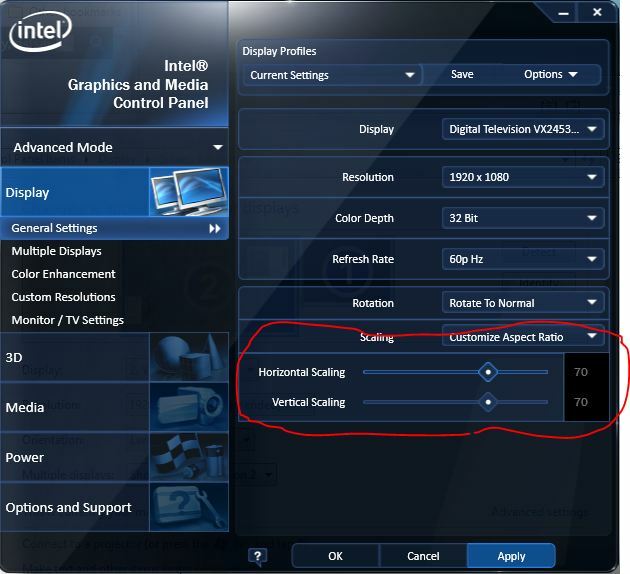 So I decided to try my last option 3 – adjust the monitor. I went through each menu carefully. And voila! I found the source of the problem. As it turned out, this monitor has two different modes for the HDMI input: AV mode and PC mode. 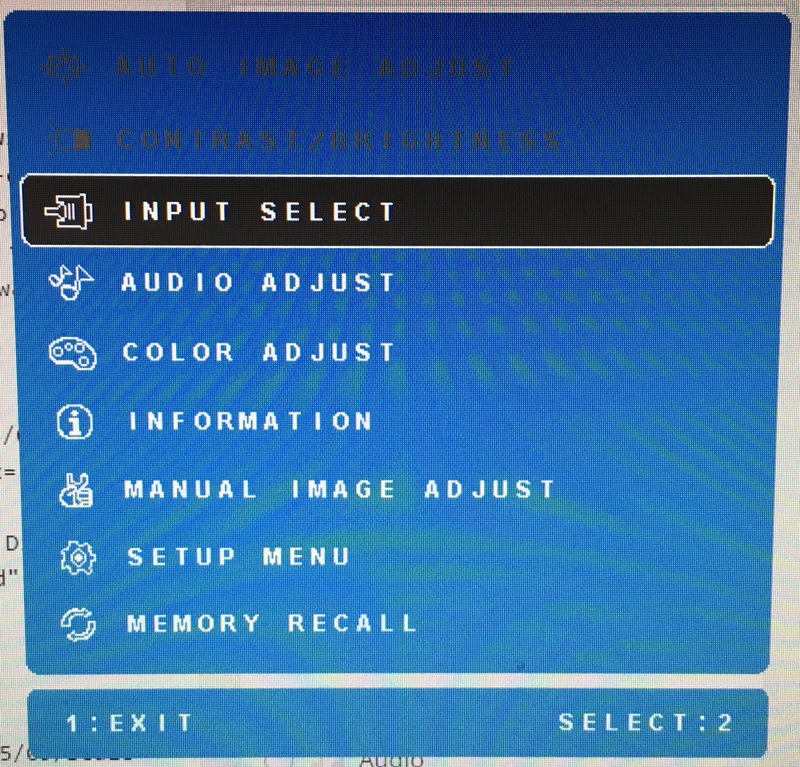 The default is the AV mode which automatically crop out 30% of the display. By selecting the PC mode. The problem went away after changing the Scale to “Maintain Display Scaling” and the display was fantastic! Problem fixed! By running the display via the HDMI cable, the sound can be redirected to the speaker of the monitor. 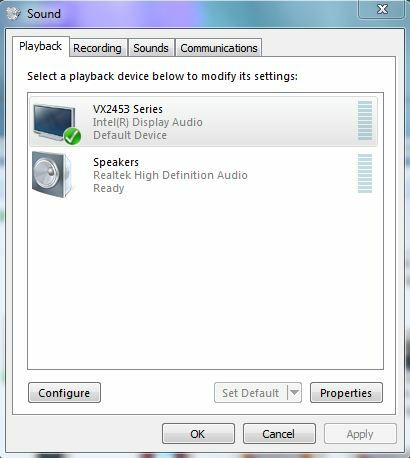 But I had to manually changing the sound output to the VX2453 by right clicking the speaker icon on the bottom and select “Playback devices” and then select “VX2453 Series” to be the default output. That was the bonus! Hope you find this tip helpful and wouldn’t have to waste the 2 hours I spent to fix the problem.